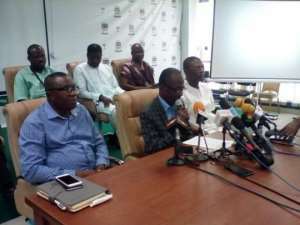 The National Democratic Congress (NDC) on Tuesday called on government to stop denying corruption allegations levelled against some government appointees and put in measures to fight the menace. It said the cover-ups of corruption allegations and wrong doings of appointees is only deepening the public mistrust of the Government. Mr Johnson Asiedu-Nketia, the NDC General Secretary, addressing the media in Accra, said: 'Fighting corruption begins with honesty and if you are starting with denials, you are only compounding the problem'. He, therefore, urged the Government to admit that corruption exists among public officials and start working towards addressing it… adding 'This is the only country we have and we cannot sit down and deny the obvious'. Speaking on the 2017 Corruption Perception Index (CPI), published by Transparency International, Mr Asiedu-Nketia said the assertion that the poor performance of the country in 2016 accounted for the country's poor performance in 2017 was unfounded. The 2017 CPI scored Ghana 40 per cent and ranked it 81 out of 180 countries/territories included in the index, while the 2016 index scored Ghana 43 per cent and ranked it 70. The CPI used nine out of the 13 data sources of independent institutions with high level of credibility to compute the index for Ghana. The NDC General Secretary noted that out of the nine data sources, only two was based on 2016 and even the average of those two was higher than what Ghana scored in 2017, adding; 'It is even possible that these 2016 data had pushed our scores to 40'. He said countries such as Burkina Fasso and Losotho, which hitherto were far behind Ghana, had now overtaken the country. He, therefore, blamed the country's current poor corruption performance on the barometer on massive corruption and wrong doings of people in government. Mr Asiedu-Nketia cited the infamous 'Cash for Seat' allegation, saying; 'Our Parliament can make mockery of it but those business expatriates who were made to pay those monies have their embassies in Ghana and are closer to those international bodies doing the rating'. 'We are, therefore, adding our voice to civil society organisations and other non-governmental organisations to call on government as a matter of urgency to pass the Right to Information (RTI) Bill and all other bills aimed at fighting corruption in the country,' he added. Mr Asiedu-Nketia said the passage of the RTI Bill was crucial to make the work of the Special Prosecutor complete because he needed the information before he could prosecute. He called on the media and faith based organisations to continue offering constructive criticisms to build a better Ghana.